We have updated our DeckStainhelp.com site with numerous new reviews and articles for 2019. The site has also gone under a major renovation to the structure and look. We made it easier to navigate and find deck stain help articles and reviews. We also improved our comment system by adding the ability to upload pictures of your deck when asking questions or making a review. Those who are familiar with the deck staining process are aware that you must properly prep your deck before staining for beautiful results. In this article, we discuss the best deck strippers on the market. We always appreciate your input, so feel free to leave a comment below with pictures of your deck stain projects. Prior to staining a wood deck, it is necessary to properly clean the wood for the best results. Removing all the dirt, mold, mildew, and graying will help the new deck stain to penetrate better and last longer. When dealing with a deck that has an old failing deck stain on it, a simple wood cleaning is not enough. 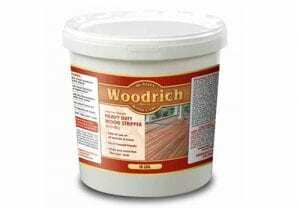 In this case, a deck stain stripper must be used to emulsify and soften the old stain so it can be removed more easily. Wood stain strippers are more aggressive than a typical wood cleaner. Those who are familiar with the deck staining process are aware of how important it is to properly prep your deck before staining for beautiful results. In this article, we discuss why deck stain stripping can be easier than deck cleaning. We always appreciate your input, so feel free to leave a comment below with pictures of your deck stain projects. The difference between deck cleaning and deck stain stripping is simple. With deck cleaning, you are simply washing the wood to remove any dirt, grime, mildew, and graying. 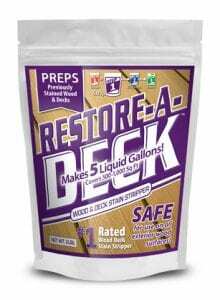 With deck stripping the same contaminants are removed but you are also removing any old remnants of deck stain. In many cases, deck stain stripping is better because you are removing old deck stain in addition to other contaminants like dirt and graying. Those who are familiar with deck staining are aware of how important each step of the process is, especially the initial prepping that precedes the stain. In this article, we discuss the importance of using a quality deck stain stripper when you have an old coating on your deck you need to remove. We always appreciate your input, so feel free to leave a comment below with pictures of your deck stain projects. When it comes to restoring an older wood deck, it’s extremely important to prep the wood correctly. Not doing so can lead to premature failure of the new deck stain. No matter the brand or cost of a deck stain, it will not last as long as it should if it isn’t applied to a perfectly cleaned and prepped surface. We appreciate your input here at Deckstainhelp.com as we continue to be your go-to source for the latest in deck restoration news and trending topics through 2019. This is a revised article about how to remove a solid deck stain. They are can be very difficult to remove and take time and patience. Feel free to leave a comment below. Once a deck has been stained with a heavy pigmented or solid stain it can be hard to maintain. Solid deck stains are like paint in that they form a film on the wood surface to provide weather protection. Once it is time for maintenance, a good cleaning and recoat are necessary. After several years the solid stain begins to build up and has trouble adhering, thus it begins to peel and flake constantly. To stop this negative effect from occurring, or to switch from one deck stain to another, it is best to remove the solid deck stain completely and start with bare wood again. But removing a solid deck stain takes patience and a little bit of work. To remove a solid deck stain you need to start with a deck stain remover. Stain strippers contain aggressive ingredients to help break through and soften tough to remove deck stains. Once the stain begins to emulsify it can then be pressure washed off. Clean or Strip the Deck Stain? Update for 2019: Clean or Strip the Deck Stain? We appreciate you visiting Deckstainhelp.com as we continue to be your go-to source for the latest in deck restoration news and trending topics through 2019. Below, we talk about whether you should Clean or Strip the Deck Stain? Feel free to leave a comment below with any pictures you may have. Knowing the difference between deck stain stripping and deck cleaning can be vital to your deck maintenance or restoration project. It’s important first to understand why cleaning a wood surface is necessary. Besides the obvious of overall appearance and curb appeal, a wood deck should be cleaned and sealed every couple of years to prevent structural damage. Water and moisture wreak havoc on wood inviting mold and mildew which can lead to wood rot. The sun’s U.V. 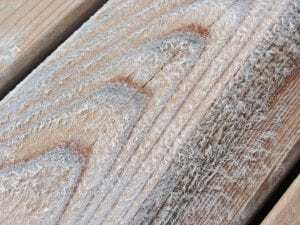 rays also damage wood fibers and turn them an unsightly gray. In colder climates, freeze/thaw occurrences can warp, crack, and split boards ruining a deck in no time. By cleaning the wood and protecting it with a quality wood stain, you are locking out moisture, blocking sun rays, and protecting the deck from the environment. This ensures a better overall appearance and a longer lasting wood structure. Do you have any questions on stripping your deck? Please ask below and post some pictures in our comment area. There are many types of Exterior Wood Deck Stains on the market. They range from slightly pigmented sealers to solid color stains. One thing is for certain, they all fail after years of neglect, rain, snow, and UV degradation. In many cases, it is possible to use a deck cleaner and re-coat over an old stain. This is not practical though if the old stain has failed by wearing unevenly, peeled or if switching brands of stains. In these cases, you will need to use a Deck Stain Stripper. Stain strippers contain a more aggressive “caustic” than a typical deck cleaner. These caustics break down the bond between the cellular structure of the wood and the old stain. This makes removal of the stain easier with scrubbing or a light pressure wash.